Political cartoons used as primary sources can be difficult for students to understand. Cultural references that they may not be aware of can be mixed with political references. These can be confusing without the proper context. 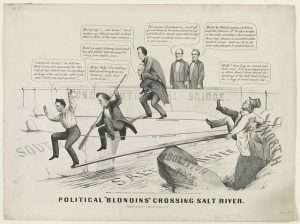 I came across one of these political cartoons and was immediately reminded of the picture book Crossing Niagara. Using it along with primary sources could help middle and high school students understand the nuances of a group of political cartoons. 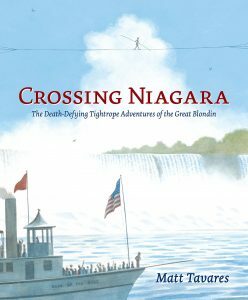 Crossing Niagara: The Death-Defying Tightrope Adventure of the Great Blondin begins with an account of the Great Blondin crossing Niagara Falls on a tightrope. 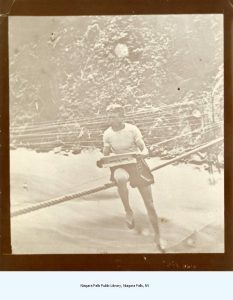 He would cross the falls many more times over the summer of 1859 and 1860. His tightrope act included him crossing with a wheel barrel, blindfolded, and even with his manager on his back. 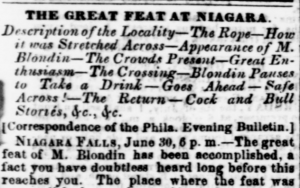 Blondin’s tightrope walking did not end in the fall of 1860. It continued around the world for years after. But those first summers put him in the spotlight of many Americans. Begin by sharing the picture book. Follow the story with newspaper articles related to Blondin’s crossings. Search Chronicling America database of historic newspapers for Blondin and limit the search to 1859 and 1860 or, if time permits, have students search for articles on the daredevil. Some news stories can be found in the curated primary source set related to the picture book. 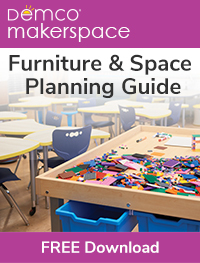 Ask students to focus on Blondin’s cultural impact. What evidence is there of his popularity? Was the Great Blondin a celebrity? What evidence do you have? Who would have known about Blondin’s feats? How would they have known? Even if students do not search for articles related to Blondin, sharing search results and examining the location of newspapers may provide some insight into these questions. As students begin to understand Blondin’s reach, pose the question, “At this time, what did people think of when they thought of the Great Blondin? What words would they use to describe him?” Before giving students an opportunity to answer, share photographs of Blondin crossing Niagara from the curated primary source set. Students may do a gallery walk using sticky notes to describe how people of the time may have seen him. If students struggle, encourage them to revisit the picture book or newspaper articles for additional inspiration. Collect students words that they came up with. Encourage them to create a word cloud or find some other way to visually demonstrate how they believe people at the time thought of Blondin. Now that students have a background about Blondin, his feats, and how he was viewed, introduce a political cartoon referencing him. Several are in the primary source set. Many have to do with the US presidential election of 1860. What is happening in the political cartoon? What symbolism may be shown in this political cartoon? How does Blondin’s story apply? What does that symbolism tell us about the political figures in the cartoon? What do you think was the intended message of the person who created the cartoon? From here, students can begin to explore the perspectives of the creators of the cartoons, intended audiences, and different perspectives that may have been present at the time of the election. This picture book and primary sources can reveal cultural references that help explain political cartoons of the time. Other pairings may reveal more about individuals or events that are more directly tied to political cartoons. 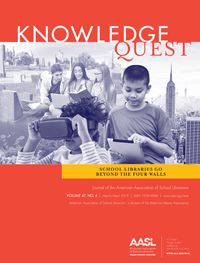 Tom Bober is a school librarian at RM Captain Elementary, 2018 Library Journal Mover and Shaker, former Teacher in Residence at the Library of Congress, and author of the upcoming book Elementary Educator’s Guide to Primary Sources: Strategies for Teaching. 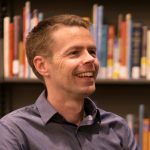 He writes the Picture Books and Primary Sources posts for AASL’s KQ blog and has written articles for several publications. Tom also presents at conferences, runs workshops, and gives webinars to promote the use primary sources in student learning. 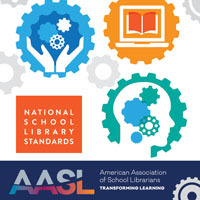 He began his career as an elementary classroom teacher, was also an educational technologist, and has spent the last nine years as a school librarian.